On a dark December evening in 1827 a sporting gentleman, who chronicled his fox-hunting adventures under the name of Nimrod (Charles James Apperley), was riding on horseback along the Yarm turnpike. Out of the darkness emerged a terrifying apparition which he later described as a ‘moving hell’, a clanking, hissing iron monster exulting ‘blazing fires of blue and yellow hues’. This turned out to be a locomotive steam engine grinding its way along the Stockton and Darlington Railway. Nimrod’s horse was terrified and it took all his horsemanship to maintain control. He wondered at the fact that such a nuisance could be tolerated so close to a turnpike road: See Nimrod’s Hunting Tours – Interspersed with Characteristic Sayings and Doings of Sporting Men (London: Pittman, 1835). 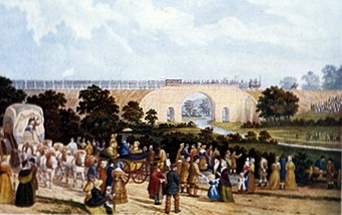 John Dobbin’s famous painting of the opening of the Stockton and Darlington Railway in 1825. Nimrod was not alone, since the railway opened two years earlier spooked horses on the turnpike had been a common occurrence. Carriages and carts were overturned and riders on horseback were thrown or bolted off with. Soon after Nimrod’s experience on the Yarm Turnpike the directors and enginemen of the Stockton and Darlington Railway were indicted in Public Nuisance. The litigation resulted in the authority of R v Pease (1832) 4 B & Ad 30, 110 ER 366. which established a very important legal principle which relieved the defendant’s of liability. The Stockton and Darlington Railway was authorised by an Act of Parliament and this set the template for the multitude of schemes that followed. The court held that the railway company could not be liable for harms which were the necessary consequence of exercising their statutory powers. It so happens that Francis Mewburn, the solicitor to the promoters of the Stockton and Darlington, had had the good sense to insert a clause into a revised Bill which expressly authorised the use of steam locomotion. This followed a famous meeting between Edward Pease and George Stevenson in which the latter had persuaded the Quaker business man to use steam power rather than horses. The existence of the section enabled the court to find that the spooking of horses on the turnpike was an unfortunate but natural consequence of using the statutory power to operate steam locomotives. The defence went on to play a crucial role in the famous ‘railway sparks’ cases where it effectively afforded the railway companies an immunity in respect of a large proportion of the extensive fire damage caused by sparks from passing steam locomotives. 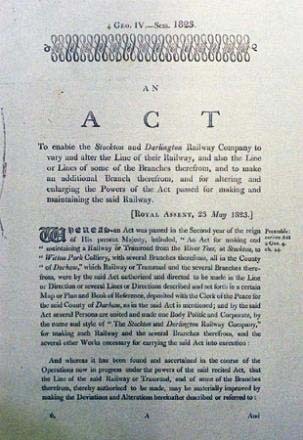 The second Stockton and Darlington Act which allowed for modifications to the route and the use of steam locomotion. The first phase of HS2 between London Euston and Birmingham is set to open around the bicentenary of the opening of the Stockton and Darlington Railway. In 2011 the Times reported that Her Majesty the Queen was alleged to have expressed concern at the potential impact of high speed trains whizzing past at speeds of up to 250mph on horses kept at Stoneleigh. Such concerns were also expressed by a number of equestrians who petitioned against the HS2 Bill at the select committee stage. This brings us neatly full circle; there may be a world of difference between the slow, clanking iron monsters on the Stockton and Darlington and the streamlined, gleaming state of the art electric trains which will operate on HS2. But horses are still timid animals likely to be spooked by something new and invasive in their environment. Another constant feature is that the Act of Parliament is still the instrument of choice for authorising major rail projects; although now the hybrid Bill procedure is used as opposed to the private Bill procedure. Thus, the High Speed Rail (London West – Midlands) Act 2017 must inevitably establish a statutory authority defence in respect of many of the harms arising from the construction and operation of the line. 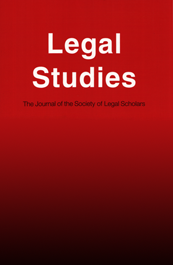 This is the backdrop to a new article published by Mark Laurence Wilde (who may have something to do with this blog) in Legal Studies. 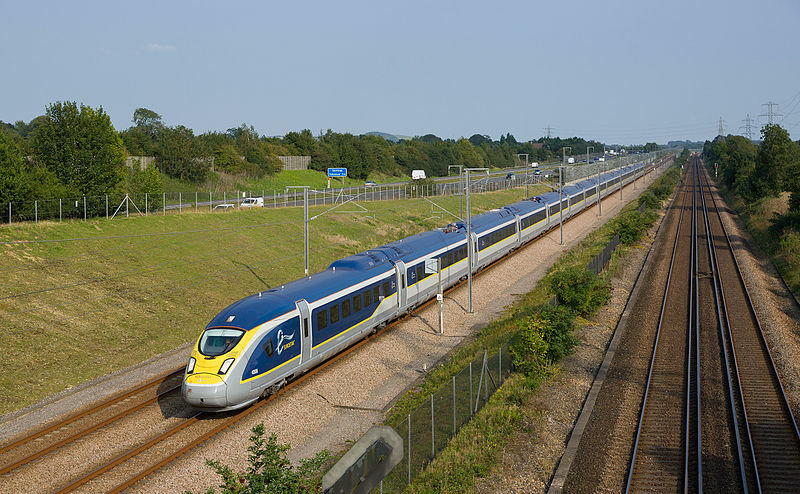 In the article Wilde considers to what extent the defence of statutory authority might shelter the operator from liability in respect of nuisances caused by the operation of High Speed trains. Whilst high speed trains are unlikely to set fire to crops and farm buildings, as their much slower steam powered ancestors were prone to do, they have the potential to cause noise, vibration and, indeed, spooked horses. Wilde focuses on a sometimes overlooked aspect of the statutory defence, namely, the ‘inevitably of harm’ criterion. In short the defence only operates in respect of harms which could not have been avoided. The HS2 project has undergone a vast amount of planning and design and an environmental impact assessment running to 50,000 pages. Thus, there is unlikely to have been a systematic failure to anticipate harms and mitigate them or at least offer compensation where they cannot be avoided. However, Wilde argues that it is still possible that the impact on certain individuals may have been overlooked. For example, not all affected parties had the wherewithal to petition against the Bill and not all who did so would have gained satisfaction. Moreover, certain individuals who may suffer nuisances arising from the operation of the line may fall outside the parameters of the HS2 compensation schemes. Wilde asks whether such individuals could call upon the common law to come to their aid. Litigants would have to show that the harm was not inevitable – on the face of it this sounds like a very difficult criterion to satisfy given the amount of planning and design that has gone into HS2. Nevertheless, it may yet be open to the owner of a riding stable to argue, for example, that additional screening measures ought to have been adopted at a specific location due to the effect of sudden train movements and noise on horses. 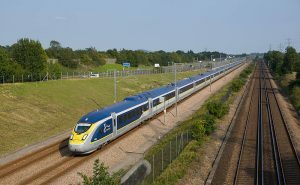 In fact, such a dispute has already arisen in respect of a much smaller scale project involving a scaling up of passenger services and increases in trains speeds as part of the upgrade of a conventional line: see noise, horses and the Evergreen 3 project. Wilde concludes that affording the common law the space to intervene in such matters allows it to perform its traditional function of filling the gaps left by legislative procedures and ‘fine-tuning’ the planners’ decisions on the ground. However, this would require the courts to adopt a bold approach to the issue of whether a harm was inevitable. Recent case law developments suggest that they might be more prone to intervene where they perceive that an individual has been left uncompensated by the planning system. This entry was posted in High Speed 2. Bookmark the permalink.